"Parties have got their heads in the sand over climate change" say Greens. The Green Party say the big three parties have "got their heads in the sand” over the catastrophic effects of climate change – and went to the Farmer's Market on Sunday to graphically prove their point! Heeley candidate Rob Unwin stuck his head in a specially constructed "bucket of sand” to illustrate his point about the other parties. He comments: "Experts warn we have less than ten years to act or we face the possibility of a global catastrophe, with more freak storms, floods and droughts. We need to cut CO2 emissions by 90% by 2050 to stop this from happening. In Yorkshire the situation is critical. The government- set target of reducing greenhouse gas emissions by 20% by 2010 (measured from 1990) has been abandoned. According to the Environment Agency the region has seen a 1% growth in emissions since 1990, the worst record in the UK. Emissions from road transport have increased by 17%, over twice the UK rate of increase, while coal fired power stations supply the UK but heavily pollute our region. With M1 road widening on the way and the opening of Doncaster Airport the region is in crisis. The Climate Change Action Plan for Yorkshire and Humberside proposed that Local Authorities, like Sheffield City Council, should adopt a cabinet member for energy and climate change. Their task would be to reduce emissions from council controlled operations and influence emissions across the city. This needs to happen now - we desperately need honest, far-sighted leadership to have any hope of managing climate change. Friends of the Earth has attacked the Labour and Conservative parties for practically ignoring climate change during the general election campaign so far, despite recent acknowledgments by both Tony Blair and Michael Howard that the issue is one of the biggest threats we face. Both have previously promised leadership to tackle it. Friends of the Earth also highlighted how the Liberal Democrats own specific policy choices have recently undermined their broader commitments on climate change. Today is Earth Day and Friends of the Earth is marking it by urging the parties to do more to raise the issue of global warming . Climate change will be at the top of the agenda when the UK chairs the G8 meeting in Gleneagles later this year. But it has been deliberately sidelined by the two main parties during the domestic election campaign. This is despite the fact that the UK is not on course to meet its carbon dioxide reduction targets - 20 per cent reduction in 1990 levels by 2010, and a target agreed on by Labour and the Conservatives. Urgent action will be needed in the coming months by whoever wins the election to get the UK back on track, and demonstrate international leadership on this crucial issue. "Labour and the Conservatives agree that climate change is one of the biggest threats we face and have promised leadership on the issue. Global warming will be at the top of the agenda during the G8 summit at Gleneagles this summer. But neither party has put any effort into raising the issue during the election. This conspiracy of silence does neither party any credit. Urgent decisions must soon be taken on transport, energy and industrial policy if the UK its carbon dioxide reduction targets. Our political parties must move the debate away from the margins to drive home the urgency of the situation." Last September both Tony Blair and Michael Howard made key speeches on the threat of global warming. Tony Blair described climate change as "the world's greatest environmental challenge" and "so far reaching in its impact and irreversible in its destructive power, that it alters radically human existence" . Mr Blair promised that along with Africa, climate change will be "our top priority" at this years G8 summit, which the UK will chair. Michael Howard also warned last September that "Climate change is one of mankind's greatest challenges" and went on to say that "The urgency of global warming means that fine words are no longer enough. We need action…I want the Conservatives to carry on leading this debate. And we will." Labour's manifesto re-commits the party to making significant cuts in carbon dioxide levels (a 20 per cent cut in the 1990 levels of C02 by 2010; a 60 per cent cut by 2050) and Tony Blair promises to lead on the environment - one of the "world's greatest challenges" in his introduction. But there are doubts about whether the Labour party will actually deliver on this. Since coming Labour came to power in 1997, UK emissions of the main greenhouse gas carbon dioxide have risen to such a level that the Britain's target under the Kyoto protocol - the international treaty to combat climate change - is now be in jeopardy. The Conservative manifesto gives far less prominence to the environment than the other main parties, and does little to give the impression that climate change is much of a threat at all. A separate `green manifesto' however, does contain a number of initiatives on combating climate change and builds on a very welcome speech by Tim Yeo earlier in the year. The Liberal Democrats put the environment at the heart of its manifesto, described by Charles Kennedy as a "green thread of environmental awareness and urgency" in Liberal democrat thinking. The party has also raised environmental issues during the campaign as an electoral issue. However, there are serious concerns about the treatment of such issues when it comes to practical choices. For example the Liberal Democrats recently opposed the introduction of congestion charging in Edinburgh, the Liberal Democrat candidate for Penrith opposes the Whinash wind farm in Cumbria, while local Liberal Democrats protested last year about increasing road fuel duties. 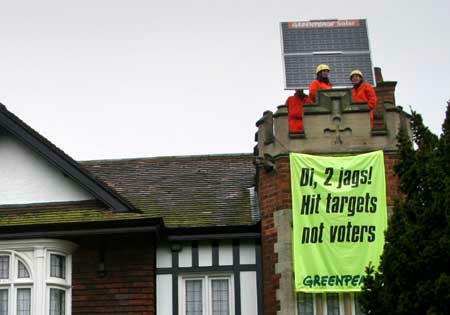 The Green Party is more focused on environmental problems than the main parties and offers more far reaching solutions. The challenge for the Greens is to make a difference in an electoral system that renders it extremely difficult for them to win seats. If the Greens manage to get a Westminster seat environmental issues would be elevated on the political agenda. The action that began early tuesday morning is still happening with one guy and a banner still forty foot up the trees in St. James Square, opposite BPs head office. It is excellent to see everything being done to make climate change a political issue. We need radical changes to address this problem and to ensure a sustainable future - otherwise the gap between the energy rich and energy poor will grow ever larger. Kyoto, even if our leaders implemented it instead of backtracking on their obligations, is acknowledged to be insufficient. As well as winning concessions from our leaders and shaming corporations, we can design our own global policy and give our leaders the option of implementing it alongside other governments or lose power. Campaigning on this is going on now during the election campaign. See http://www.simpol.org.uk/ for details of the Simultaneous Policy campaign and to get involved. It seems that no matter how many times they are told some people just will not accept the evidence over climate change. The earth is warming and the climate is changing because the world is coming to the end of an ice age. In global terms the burning of fossil fuels is not making a difference. I find it surprising that there are some, as we see above, who are still having problems in grasping the idea. The fact that governments are able to use this fallacy to encourage public tranport and therby control the free movement of the population (always a worry for governments) is compounded by the misinformed, uneducated Green movement which is still basing its arguments and views on various flawed studies and reports some dating back to 1972. I would always encourage people to cut down on their energy use but only because energy in all European counties is massiveley overpriced as a result of taxation (petrol prices at the pump is currently comprised of 82% tax) however to reduce energy use in the belief that will reduce, stop, control climate change is ludicrous. Mankind is a minor irritation to the planet, the cycle of climate change has occured for millions of years before we came along and it will continue after we are gone. Our two hundred years of industrial activity has made no difference whatsover. "please do some reading" is obviously one of those toxic vermin on the payroll of the truly evil Exxon Mobil etc. The plain fact is that nearly 3000 climate scientists have put their name to a document stating that climate change is real, is happening now, and is related to human industrial activity. And a pseudo science spouting nutter like you claims to know better than all of those experts? The cutting down of 80% of some rain forests is only a "minor irritation to the planet"? Deranged climate change denyers like you get all your blatant lies from sites like the association of rabid motorists who continue to blame climate change on termites and other such crap. You're all conveniently incapable of differentiating between recycling harmless carbon that's already in the biosphere and atmosphere, and that carbon that's been safely locked away underground as fossil fuel for millions of years. Ice ages come and go and they're strictly linked to periodical precession, wobble and ellipticity of the earth's orbit. Those changes occur over periods of thousands of years - not mere decades as we're experiencing now. You and other petrol heads like yourself come out with all this crap because your entire selfish lifestyle is threatened. You're incapable of caring a jot about the lives of future generations and entire species. You'd better start getting used to the fact that all of our lifestyles have to dramatically change. Climbing 45 feet ropes at 6 am with full packs with enough supplies to provide warmth food and safety for a treesit of a few days aint easy. Then what with rain slippery branches and difficulties with extending the line between the two trees so as to traverse out with the banner, plus ensuring a safe and injury free action makes the end result of a great banner drop really rocking. Big respect to the ground crew for all their support throughout, and big respect to the tree crews, who showed confidence and determination and help for each other before during and after. The fallacy of carbon linked global warming is just as much crap as the so called oil shortage. You are being used by the oil companies to justify high prices and the governments to enable high taxation.